After a holiday season of enjoying — and maybe indulging a little too much — delicious cookies and candies your teeth may need a reprieve! Visit any local dentist (hopefully it’s us!) and they’ll declare to you why sugar is so bad for oral health. So why is sugar so bad for your teeth? Your mouth houses a beautiful and abundant ecosystem of bacteria and when it’s in balance, you won’t have any issues. If the balance is tipped with too much of the harmful bacteria and improper oral hygiene, this is when cavities, plaque, and gum disease begin to show up. Sugar isn’t exactly the number one fall guy of teeth issues, it’s the chemical reaction and chain events that makes it so harmful. When you eat an excess of sugary food and drinks, the harmful bacteria feeds on the sugar and turns it into an acid. The acid then eats away at your enamel by leaching minerals and causing demineralization — so an overabundance of acid is the substance causing oral health issues. If your saliva production is low this will also assist is tooth decay, because salivas primary job is to lubricate the mouth and wash the harmful acid away. The biggest takeaway of balancing your oral bacteria is to limit your sugar intake to give your smile a fighting chance. So if sugar is bad, what foods (and drinks) are beneficial? 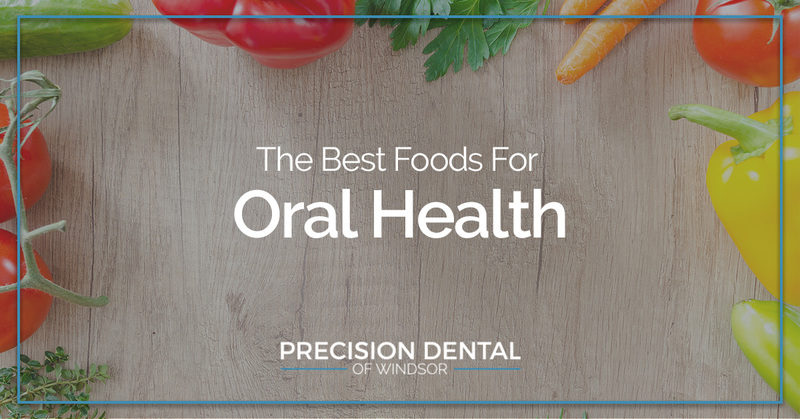 You know the adage, you are what you eat, so eating certain foods can actually benefit your overall oral health! Eating food strictly at mealtime (breakfast, lunch, and dinner) is beneficial because it increases saliva production to help wash foods from your mouth and helps reduce harmful acids. Below are foods great at any meal or perfect for a snack. Xylitol gum – While gum doesn’t fall under the food umbrella, xylitol specific gum has been shown to aid in oral health. After eating sugar or a starchy meal, chewing a piece of xylitol gum can lessen the acid attack on your teeth. Xylitol is unable to be digested by the harmful bacteria, which reduces the acid and helps restore the pH balance. The bacteria is also unable to stick to the surface of teeth which causes less plaque to build up. Water – Water is wonderful because it acts a bit like saliva. It’s able to wash away sugary substances and bad, cavity causing bacteria. Sip it throughout the day when drinking a soda or eating candy to help whisk the sugar away for best prevention. 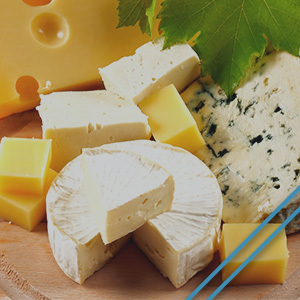 Dairy – As we explored above, acid (from sugar) leaches minerals and destroys the enamel. Dairy works it’s magic by the calcium it provides to teeth. Calcium is a hydroxyapatite that supports your tooth enamel and bone health. Fibrous and hard vegetables – While veggies are wonderful for your overall health with all the antioxidants and food-based vitamins they provide, they are also amazing for your teeth! When you consume raw veggies that are hard and fibrous, not only are they low in acid-producing sugars but they also act as little scrubbers to help remove food debris and plaque. Eating veggies such as carrots, broccoli, and cucumber not only help clean teeth but they produce saliva to help combat cavities. Strawberries – These delicious fruits are high in malic acid which can help as a natural whitener and functions in the similar way of hard veggies — strawberries (and their seeds) help create friction on the teeth to buff and polish the surface. The only thing you may want to consider after eating strawberries is a good flossing — the tiny seeds love to hide in all the nooks and crannies of our teeth! Your oral health begins with what you eat! If you’re looking for ways to help benefit and increase your overall oral health, food is a great place to start! There are a variety of food and drinks (as discussed above) that you can reach for and count on when brushing and flossing aren’t the immediate option. As always for optimum oral health, brush twice a day, floss at least once, and visit the dentist twice a year for routine dental cleanings! Connect with us at Precision Dental Of Windsor! We love seeing healthy mouths and gums so schedule your appointment today!